This blog post looks at the recent Key Stage Two (KS2) maths assessments. As a maths coordinator and year 6 teacher, I was very interested to see the new tests and hoped for my year 6s that they would be fair. My first impression is that the levels are appropriate and that the coverage matches up with what I expected. Starting with the arithmetic paper, there is a clear assessment of mental maths methods and learning taught across KS2. Although working out space is given, I think most children would be able to solve the first 10 questions using mental maths. Bridging through a place value (question 1), number bonds (question 2) and near multiples (question 4, 16 & 18) are all covered. In amongst these, there are two division problems that look a little more challenging. Questions 6 and 9 could both be solved using a written division method but children could work it out using mental maths is they know 5 X 20 and 4 X 25. I think it’s really good that the men tal methods taught to children across primary school are being included in these formal assessments (even though they aren’t actually in the curriculum!). 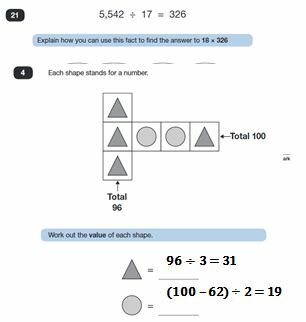 Place value is assessed in a range of questions across all three papers (specifically decimals). With confidence in how the number system works, children should be able to solve quite a few questions quite easily (examples provided!). Others are more difficult but the children could use what they know to help them eg. Question 21: 4 – 1.15 & 400 – 115. The written arithmetic aspect of Paper 1 was in line with what I expected, although some of the questions would definitely put off weaker mathematicians. 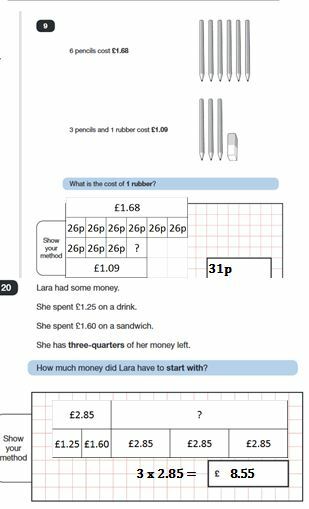 Question 26 (15 x 6.1) involves multiplying decimals which really tests the children’s ability in laying out their work clearly (although it again can be solved mentally – 10 x 6.1 plus half of 10 x 6.1). The other tough question was 30 (6574 x 31) simply because of the number of steps involved and the scale of the numbers. Unsurprisingly, there were a lot of fraction questions across the papers and in particular in Paper 1 (where 12/36 = 1/3 of the questions were based on fractions!). The new curriculum content is assessed in some challenging questions which probably deserved more than one mark (questions 31 & 35 shown). The children’s depth of understanding was also looked at in other questions (Paper 2: Question 7 & 10 (worth 2 marks even though no more difficult than the one mark questions!)). I wondered about the separation of arithmetic into a specific paper and feel that the weighting of marks doesn’t relate to the challenge of the questions. Some very easy marks are balanced by very challenging questions only worth one mark. There is plenty of arithmetic required in the other papers (Paper 2: Questions 3 & 4, Paper 3: Questions 6 & 11 – to name just a few!) and the last question on the test (shown) involves actually understanding how division and multiplication relate to addition and subtraction. Another area of new curriculum content on the tests that had everyone feeling nervous was algebra. On the surface it seems to only be a small number of questions (Paper 2: Question 12 is a classic substitution question for instance) but in reality the skills learnt from manipulating equations (or number sentences if you prefer) are much more common. Paper 3: Question 4 is algebra without the letters whereas Paper 3: Question 13 relates to inverse operations. Perhaps the best example is Paper 3: Question 16 which is literally a balanced equation. Our school has recently invested in OUP’s Inspire Maths and it uses the bar model to help children visualise and solve problems. There are a number of questions on this paper where this sort of methodology would benefit the children (often children just don’t know where to start!). I have found this method really useful for giving the children confidence in solving multi-step word problems, often including fractions. The questions that this method would assist with are usually the higher marks questions. The 3 mark question Paper 2: Question 19 doesn’t involve the most challenging maths but I know that less able mathematicians would be put off simply by the number of marks. The number of steps involved makes it quite a convoluted question, which risks discouraging children and not giving them the opportunity to show off their best. The other areas of the curriculum (Shape and Space and Data… sorry Geometry and Statistics) are covered in limited detail across the three papers. In my opinion, this is a shame as often children can excel in these areas where they struggle in others. Of course we want children who are confident with using number in a range of ways but we also want them to be motivated to achieve. I’m uncertain whether this assessment will encourage reluctant mathematicians to keep working at their gaps in understanding. But then again I am not sure that was really the point.